When first learning how to ski, there’s usually more crashing than progression down the mountain. But once you find your balance (and can keep both skis going in the same direction), you can not only get down the hill in one piece, but also feel comfortable enough to take risks and enjoy the ride. And as Charlottesville, Va.-based bluegrass five-piece/outdoors enthusiasts The Infamous Stringdusters play their 2013 Ski Tour—bringing their toe-tapping ruckus of a live show to the Intermountain West—there’s no question they’ve arrived at their desired destination as musicians. Hall, along with the other four members of the ’Dusters—acoustic virtuosos Chris Pandolfi (banjo), Jeremy Garrett (fiddle), Travis Book (stand-up bass) and Andy Falco (guitar)—allow themselves the freedom to simultaneously honor the traditions of bluegrass while pushing the genre’s boundaries. 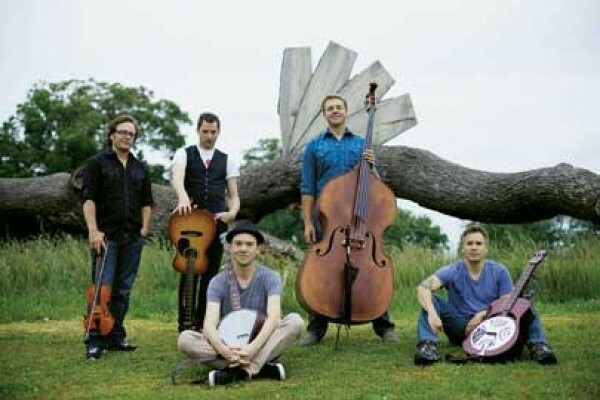 The Infamous Stringdusters’ knack for weaving traditional bluegrass instrumentals and harmonies with diverse musical influences links them to the Earl Scruggs Revue, New Grass Revival, Leftover Salmon and others. “A lot of the music that we compose and we write doesn’t necessarily have a bluegrass beat,” Hall says. “It might have more of a rock beat and chords and even subject matter. We’re not really singing about cabins on the hill so much as we are about a variety of life subjects. That attitude of exploration, adventurous energy and an open-armed approach to life are driving forces behind both the Ski Tour—which offers plenty of opportunities for the band to hit some fresh powder between stops—and how the Stringdusters are able to effectively bring the human-based intimacy of bluegrass to large concert venues. Although best experienced live, the band’s contagious energy was effectively captured on a live-performance CD, We’ll Do It Live, released nationwide in October 2012 as part of the deluxe two-disc edition of their latest album, Silver Sky (High Country Recordings, the band’s own label). With a shared musical vision in their pocket and a new album in the works, The Infamous Stringdusters’ world is full of possibilities, like a perfect day on the mountain. Wednesday, Feb. 20, 9 p.m.